The “Khmelnytskyi Jiu-Jitsu 2017” championship was held in Ukraine recently. Young fighters from the SC “Borets” / ZR Team Kropivnitskiy also could not miss such sports event. Once again they have shown, that they are one of the best in the sports arena. In general, the sportsmen of the SC “Borets” took 6 gold, 1 silver and 1 bronze medal! It is worth noting individually the achievements of the Serhii Krasovskyi and Andrii Lukiianchuk. Krasovskyi got the first place in his weight category and the first place in the absolute category among the juveniles. Lukiianchuk also won the first place in his weight category and the second in the absolute category. According to the head coach of the SC “Borets”, Ievgen Skyrda, this tournament was organized at a rather high level and impressed both participants and audience. 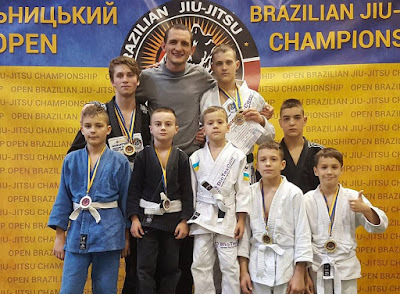 Skyrda also noted, that this time at the championship were a lot of competitors and it means that BJJ becomes more and more popular among the Ukrainians.